We are very proud of our Dining Services Operations and are happy you have chosen to visit us. If you have any questions feel free to give me a call or send me an email. Sandusky Dining Services has taken over management of the Sandusky Brass Lantern Restaurant, located in Sandusky High School. We are now open and accepting reservations, from groups or organizations, for Breakfast or Lunch Banquets (20 to 50 people). We have interactive white board capability in the dining room for your meetings after the meal. Click on logo on the right side of this page or the link on the left side. Sandusky City Schools are pleased to inform you that we will be implementing a new option available to schools participating in the National School Lunch and School Breakfast Programs called the Community Eligibility Provision (CEP) for School Years 2018-2022. What does this mean for you and your children attending Sandusky City Schools? Great news for you and your students! All enrolled students K-12 are eligible to receive a healthy breakfast and lunch at school at no charge to your household each day of the 2014-2018 school years. No further action is required of you. Your child(ren) will be able to participate in these meal programs without having to pay a fee or submit an application. If you wish to file a Civil Rights program complaint of discrimination, complete the USDA Program Discrimination Complaint Form, found online at http://www.ascr.usda.gov/complaint, or any USDA office, or call (866) 632-9992 to request the form. You may also write a letter containing all of the information requested in the form. Send your completed complaint form or letter to us by mail at U.S. Department of Agriculture, Director, Office of Adjudication, 1400 Independence Avenue, S. W., Washington, D. C. 20250-9410, by fax (202) 690-7442 or email at program.intake@usda.gov. 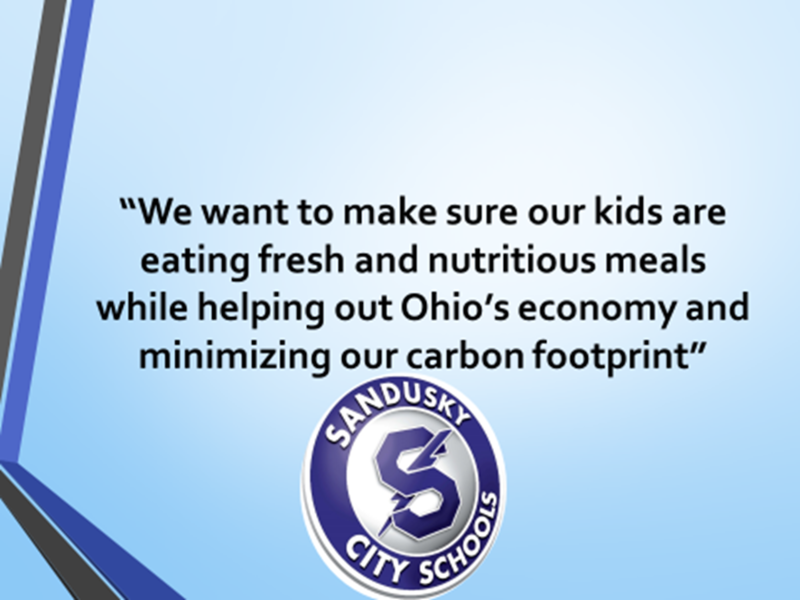 Sandusky City Schools has a farm to school program. We purchase fruits and vegetables from a local company, Maschari Brothers Fruit and Produce. Maschari's purchases their produce during the season from local farmers in a 30 mile radius. From November to May we purchase local apples from Eshleman Fruit Farm in Clyde, Ohio. Milk is purchased locally from Toft's Dairy. Local unpasteurized honey is from the Retired Huron County Bee Inspector, and the Local Future Farmers of America Chapter fruit sales. Sandusky City Schools, Medical Mutual, and The Chef's Garden Farm, a local farm, are offering employees of Sandusky City Schools a chance to purchase vegetable packages from The Chef's Garden. The Chef's Garden is well known for it's variety of vegetables. It ships unique and exotic vegetables to top restaurants all over the world. Employees should log into the Mutual Medical website, go to the Wellness drop-down menu and select The Chef's Garden. A variety of vegetable packages are available, priced at $25.00 plus shipping.